Thomastik Vision Rosin for Violin grips the string well and aids in projecting the sound of your violin! Its design in producing very little dust helps reduce bow noise on the string. Thomastik Vision Rosin works best in cool, dry climates and during winter. Vision rosin enhances the tonal qualities of the Vision line of violin strings including Vision Original (all gauges), Vision Solo, Vision Titanium Solo, and Vision Titanium Orchestra. Consider mixing the Vision Violin Rosin with Peter Infeld Violin Rosin or Thomastic Dominant Rosin to adjust the grip to your personal liking during different seasons. 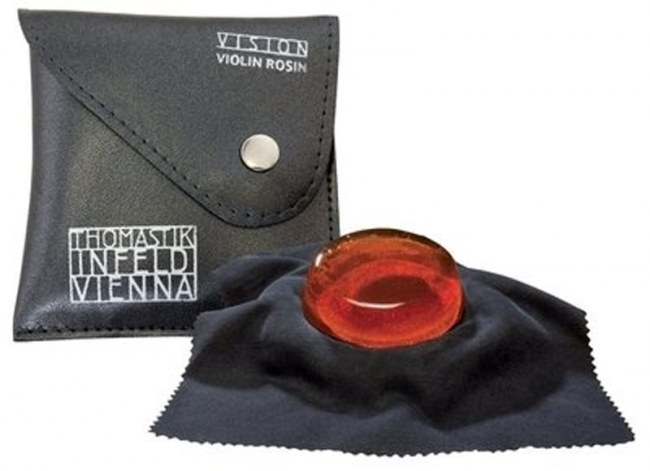 For an extreme grip on your violin, use the Vision Viola Rosin! It's stickier than the Vision Violin Rosin and provides extra friction.